Boo Bradley is a hot blues stompin’, jelly roll jumpin’, rag jazz infusin’, two-man acoustic jug attack from Madtown, Wisconsin. These boys throw down a porch stomp boogie chock full of old time Delta moans from the likes of Son House and Charley Patton, the Piedmont shake of Blind Boy Fuller and the earliest Chicago Ragtime mastery of cats like Blind Blake and Big Bill Broonzy. 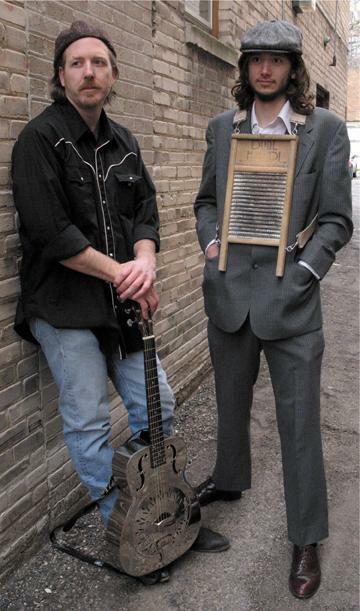 Scott “Boo” Kiker on the resonator guitar and vocals, and Brad Selz on washboard.